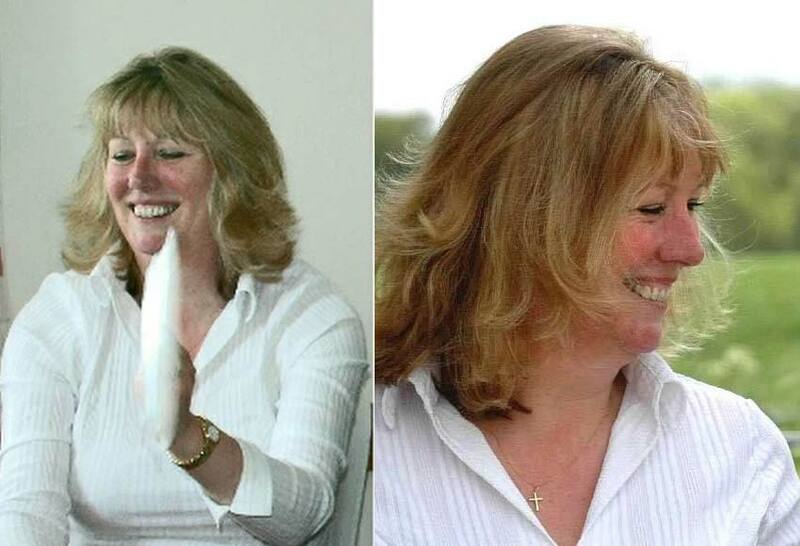 After a life of many years working the usual 8 or 9 to 5 daily routine there is nothing we love more than having taken up the life changing opportunity of presenting ‘Music for Health’ workshops and life changing it has have really proven to be! Aside from being the most fulfilling work we have ever done, no longer do we have to get up at the crack of dawn, wondering what another long work day holds for us while we are coping with the busy traffic. We can’t understand why it’s called the ‘rush hour’ when the ‘slow hour’ seems far more appropriate! Also instead of separate long days we love working together and sharing the experience. It’s great too that now our ‘workday’ doesn’t start until mid morning so we are able to head off to our first music workshop unhurried, brighter and much more relaxed. On arriving at one of our regular visits at the care home we are greeted with our usual warm welcome from the manager and staff then as we enter the lounge we see the residents faces light up as they anticipate an hour of music and interactive fun with us.We thoroughly enjoy the hour together sharing music, memories and fun activity, with all having a good time. After the hour as we leave them uplifted and with even bigger smiles we can’t help but ask what better job could there be? Nothing can beat the reward that making such a difference to these folks lives gives you, the great thing too is we are also earning a good income at the same time! Afterward we pop home for a while to enjoy lunch as we have two hours or so before looking forward to an afternoon workshop at another one of our other local care homes. This is another home that regularly book us and where we also receive a hearty welcome. Unfortunately for many reasons we sometimes find a resident may be feeling low or just not having a good day. During the workshop it is truly amazing seeing these ones becoming transformed, like watching a dim light becoming brighter and brighter. We have seen staff and visitors looking on with mouths open almost in disbelief at such a positive change in someone.They are seeing the power of the workshops in action! 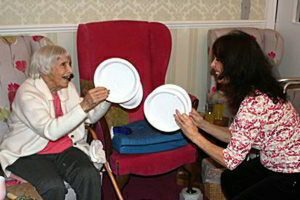 Then as we finish and the residents are eagerly asking when we are coming again is it any wonder why we love what we do! On our way home we find ourselves relating some of the experiences that are so encouraging and never cease to amaze us. We are often home around 3.30 – 4pm long before all the usual evening work traffic hits the road. We contrast this with the tired feeling and extra stress so many jobs can leave you with at the end of the day. If also for some reason we are not having a good day ( it happens to us all!) we find presenting the workshops is the perfect remedy as they really uplift us too! We think you’ll agree not many jobs actually help to lessen stress so for us it ticks all the boxes. We are our own boss and enjoying the freedom! We love working together and sharing positive experiences. 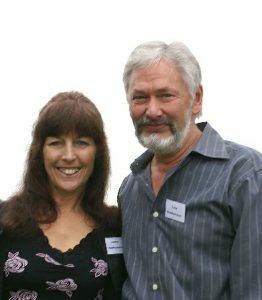 We have the fulfilling satisfaction in helping to make a real difference to the lives of so many people, benefiting their well being. We feel the joy we are bringing to others reflecting back in our lives too. It really doesn’t feel like ‘work’ when you truly love what you do. Plus the icing on the cake is that for a lot less hours we earn a good income at the same time. So……. life changing? 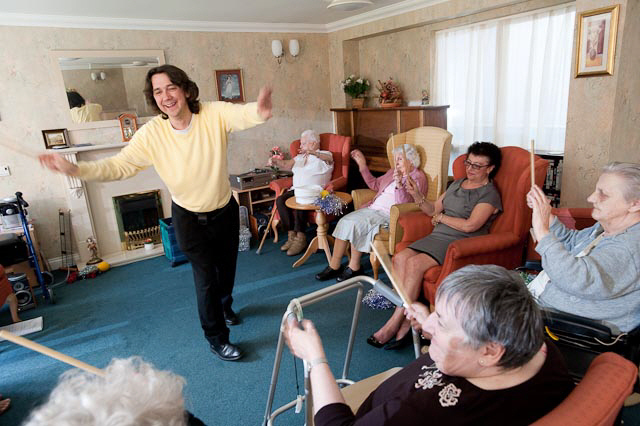 ‘Music for Health’ is a win win for the residents and us too,we wouldn’t look back! 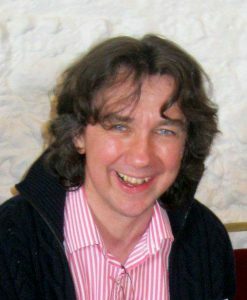 Hi There, I’m Richard the Music for Health director in Shipley, West Yorkshire. I have been with Music For Health for over 8 years now which seems unbelievable but they do say “time flies when you are having fun.” This work is fun and certainly a lot less stressful than anything I have done before . I had been working in the banking and finance when I joined Music For Health but having been made redundant 3 times I didn’t want to carry on carrying on anymore ! I wanted to do something I enjoyed and had more control over but I needed to make a living too (the mortgage still needs paying.) Music For Health ticked all my boxes and appeared almost too good to be true ….. but it is true ! 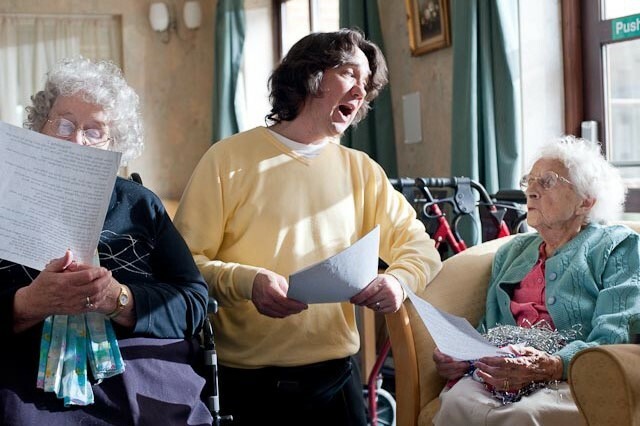 I deliver 15 fun filled musical hours at ‘homes’ in my area and I get as much fun as the residents from them. A chunk of time is taken up travelling from one booking to another. I also need to raise invoices, keep track of accounts & look out for new business opportunities. Its quite a simple business to run. It takes time but “its not rocket science” as they say. I can do as many as 4 bookings in a day so I offer time slots which enable me to do a second booking that afternoon. For example tomorrow I have bookings at 10:30am , 1:30pm 3:30pm and 6pm ( the 1:30pm or sometimes 1:45pm slot enables me to get a 2nd booking done later that afternoon about 3 or 4 miles away.) There will be easy opportunities 2nd bookings where there are homes literally next door to each other or close by. This sort of time planning is not as necessary for those planning a slightly less busy week than mine . I am often complimented on the workshops I provide by staff and residents. Remember though, you cant please all of the people all of the time. There will be times when residents will tell you its silly or you’re silly ! (I agree its part of the job.) However if we are bringing fun and a smile to some and hopefully the majority then we are doing a good job . . I feel I do work which is fun and worthwhile and its difficult to put a price on that. It’s Monday morning, I’m so lucky not to have the Monday morning blues, like so many people who are in jobs they really don’t like that much. So, my car is packed and I am ready to go!!!!!!!!!!!! It’s raining, which means by the time I unpack the car and ring the doorbell of my first home, I will look a bit bedraggled (and I must say looking like a drowned rat sometimes), but I know when the door opens I’m going to be greeted by a lovely smiling face, the owner of the home, whom I have been visiting the past 13 years. She always greets me the same way, big smile, and asks me if I would like a drink. 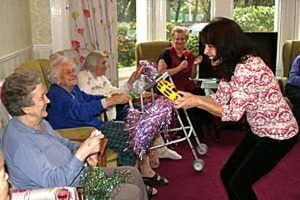 Her friendly manner is reflected in all the staff and her happy residents. As I go to the lounge I usually take a quick look around to see if everyone is seated, today I notice two new ladies, who are deep in conversation, I am told later they moved in a day apart, and became friends almost immediately, they stopped talking and were watching me set up my equipment and one of them asked what was going on, before I had chance to explain John told them “ Oh you are going to love this, it’s the Music lady she comes here a lot and she lets us join in, she lets us play with her instruments and we sing songs and we have a quiz, which I nearly always know the answers, its good fun” To be fair John is brilliant at the quiz, what he doesn’t know about music isn’t worth knowing. My session starts after briefly explaining what Music for Health is about, its usually very lively and can get quite noisy at times in this home, Val always has to have the same tambourine, she shakes it so hard she broke it once, thankfully hubby managed to repair it, Harry always insists on having a drum, and I must say he has got a brilliant rhythm. When it came to the nice listening piece the two new ladies Doris and Gladys started chatting again, they were discussing me,( like I can’t hear ) the conversation went like this. Doris: Oh can you see that thing on her ankle? Gladys: Oh yes, what do you think it is? Doris: It looks like a bruise. Gladys: Shall we ask her? Doris: No I don’t think we should because I think it looks like something from the war. Gladys: Oh yes that must be it, poor girl. They thought the tattoo on my ankle of my grandchildren was from the war!!!!!!!!!!! I really had to try hard to keep a straight face. How old do I look today? I really must stop partying so hard at the weekends HA HA!! I leave the home to shouts of thank you for a lovely morning, when are you coming again? Can you come every day? Time for my lunch and then I am going to do it all again this afternoon. Oh no, I have just remembered which home I will be going to this afternoon ,shall we say “very interesting” a EMI home with some characters, but that’s another story!!!!!!!!!! But I have so many stories, some funny some sad and “Beam me up Scottie” moments. But I wouldn’t miss them for the world. As the title says this is just one day, there are a lot more days. I count my blessings all the time to be able to have such a wonderful job, knowing I am making such a difference to so many peoples lives and also getting so much in return. How special is that?? ?